The standard format is the best if you want each guest to have a similar amount to say. This bundle contains different versions for different numbers of guests. This is a great choice for a small murder mystery party. I used this for a group of older girl scouts and we had a blast! This is the fifth one we have done and we love them all!! 10th May 2017 – imported from our previous shopping cart system. Perfect as a celebrity game, for cruise ship games or for anyone anytime! A few of the famous have come along to share the lobster. But Karl Virgil, has been found overboard as full of water as he was of his own self-importance. Although we have more comedians on-board than we do detectives, this is no laughing matter. Tilly Song (a megastar singer) has hired a luxury-plus cruiser to see the Bahamas and have a holiday. She has invited a variety of other famous people along to share the lobster. But just as the party was about to start, Karl Virgil, that mad-man troublemaker, has been found overboard as full of water as he was of his own self-importance. Was it one of the singers or actors or was it the tennis or the basketball star or one of the others? Although we have more comedians on-board than we do detectives, this is no laughing matter. We have to find out who did it. Twinkle-fingers: "I have passed beyond – to the world of eternal glitter. But sometimes I come back to add a bit of razzle/dazzle to people's lives back on earth." "Stephanie- The party was a smash! Everyone is still talking about it..... Had 1/2 the group over this past weekend for a post gathering to look at pictures. The costumes were great. Great great fun! All were very impressed that we found a co. to write the script... They loved the script, it played smoothly! At the end, we went around the room and asked "Who & Why". Many had long sordid tales but only one guest guessed who did it and why.... She was exactly correct, we were quite surprised!! Thank you for all your hard work, your effort were greatly appreciated. Until next year!" "The party was a hit! We had been having trouble coming up with something for our son's 11th birthday party. We have always been creative with Carl's parties and a bit over the top (pokemon pool party, medieval birthday ball, private skating party with beyblade tournament and "10" trivia) so we were stumped. How can we downsize the party now that Carl is getting older, spend less, and still have a unique party. Well, you were the answer! I was amazed at how little effort it took on our part, and how much the kids got into the costumes and the mystery. AND how much fun I had, too. At first I thought it would be too difficult...well, they showed me. It was tough enough to keep them in the game, but not too challenging that they couldn't have fun with it. It was AWESOME! Thanks for your help! "I had a party just this past weekend for my daughters 14th birthday. It was a hit. I almost died when the kids were walking through the door. I honestly never thought we would get people that were really into it. I mean a expected to come like the character suggestions, but not all out the way they did. We actually went and bought more prizes during the dinner because they went so far out. These are 8th graders. We did the Balmy Bahamas Cruise. It was fun." "I just wanted to let you know that the youth really loved playing "The Balmy Bahamas Cruise". Who would have thought that someone so "innocent" was the guilty one! The kids had a "murderous" time. 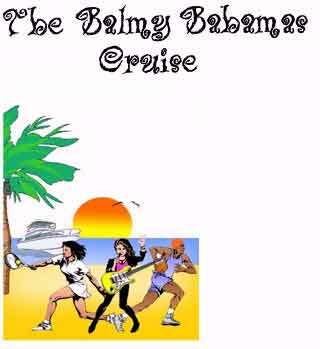 "The Balmy Bahamas Cruise was selected for our annual high school murder mystery dinner. They mystery was perfect. The location was a community center that we turned into a cruise ship. The dinner was held in the "Spanish Wells" dining room which served a Mexican fiesta buffet. So incredibly easy to plan and a terrific event for 45+ high school students! Thank you for making my job as coordinator so easy! " "We had the BEST time last night with our Girl Scout party!!!!!!! Thank you for this FUN kit! We'd love to do it again, it was a fun, fun time. We're passing on info to the other Girl Scout troops in our Service Unit about your kits. Thank you!!!" "Hi, just wanted to send you some fun photos from the murder mystery party that I hosted for my daughter's 14th birthday party. It was a huge success, super easy to host and the girls all got really into it. Thanks so much for making this so easy. "May 9, 2009, was our Murder Mystery "The Balmy Bahamas Cruise" party held at our home in New Hampshire. Since most of us have cruised before and/or been to the Bahamas, this was the perfect choice. I took the picture of the Goombay Deck Plan, enlarged it and posted it on the wall beside the Suspects Page. Then I made signage to put up around my house. Made the deck look like a ship deck with wall posters and put "Karl" face down outside on the ground below the deck and put orange tape around him. I did the same concept out front but with the half-deflated monkey. I greeted everyone as the Cruise Director, created Boarding Passes with assigned cabins based on the Suspects Page information. Guests went up the front steps to the ship's photographer Don. After a picture in front of the beach scene wall border, guests proceeded inside to Tilly Song and gave her their boarding passes and she gave them their name tag. Guests then got a "Goombay Smash" drink (found on IslandFlave.com) and went to the ship's deck outside to do the introduction of characters. I served a meal course in between each act. We had a mystery dinner last yar for 10 people from another party provider. We all felt Merri Mysteries was better. We had 14 peoples this year - it was great to have the expandable packets. Clues for each act were great but some felt a few questions added to each act would make it more interactive. Only 2 of the 14 guessed the murderer! Overall, it was a HUGE success and we are all looking forward to next year's. I gave all the men "Winner" medals (from the Dollar Store) and the women crown jewels on a stick as prizes for their costumes since they were all great. The winners of the Who Guessed It got liquor nips. There will be lots of parties between NH and Massachusetts as this concept grows from our parties!" I just wanted to let you know that my party turned out awesome. Everyone had so much fun and really enjoyed themselves. Thanks for all your help in getting me ready for my event. Scroll down below and click on the kodak gallery link and you can view our pictures of the party. Enjoy and thanks again. We really had an awesome time. Every one is still talking about it. Note: The reading levels of each kit (not just "page" as it says below) were determined by copying and pasting the kit (the play version), into The Readability Test Tool (see www.read-able.com). I'm a soulful singer/songwriter with a voice as pure as the Canadian air I breathed when young. My voice has brought me wealth and fame and I like to share it with my good friends. Don't let my orange hair and tattoos confuse you or I will have the ball in the basket before you've have time to say my name. I'm a stand-up comedian. As my name indicates, I'm a cross between a perfume and a candy store. Don't sniff too hard or you'll eat me. I'm a comedy writer. I write very funny books. Some say I'm crass, outspoken, brutally honest and controversial – a loving force to be reckoned with, and I have to agree. When I play tennis with you, don't try and hit back. Just watch the ball zoom past – if you can see it. Some say I'm brilliant, honest and bold. I say – watch that ball! I'm from Argentina. In the past I sang duets with Tilly, but now I don't need her help. My dark swarthy looks and show-boatie charms have won me my own fame. With my own interview TV show, what more could I want besides maybe a bit of peace and quiet? But I like to challenge people so I only have myself to blame for stirring up hornet's nests, I guess. As a child in Bolivia I saved my village from raiders. With my newfound sense of power, I went on to become a TV hero. Now I devote myself to fighting for the greater good. After Hercules saved me from being slain when I was a child, I pledged my life to roaming the world with him. I learned to fight and now I am his co-star on TV as a princess and we are happily married. Like Elvis I'm back for a visit from the other side complete with my flamboyant outfits, glitter, gold and magic piano playing hands. I wasn't invited. I am just ghosting around. I'm a serious actor/director/producer with a capital S. I'm also a classy lady. I have had lots of practice, having started in this career aged three. Please don't bother me; I prefer to lead a very private life. I'm a world famous model. Men swoon at my feet and are in total adoration of my fabulous looks. When it comes to work, I can name my own price. Our Sunday school class loved this as a social event!! This is our 3rd time to use Merri Mysteries and will definitely be back for more!